Hi guys. I'm presenting here a simple DC to DC converter to power various DC.... operated circuits. It can provide DC power.... supply up to 18 volts DC. You have to select a desired voltage value and its covert it, at just voltages it can regulate current value. All you do is just change the value of.... the Zener diode. Input voltage for the circuit is obtained from a 18 volt 500mA transformer based power supply. You can also take an input supply from the battery. The 18 volts from the source is given to the controller and the base of the medium power trasitoer BD139 (T1). 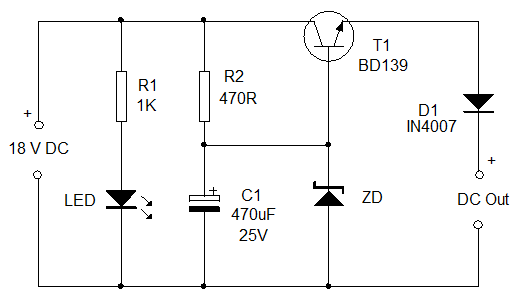 Resister R1 limits the base current of T1 so that the value of output voltage regulated. Zener diode ZD regulates the output voltage. Select the appropriate value of the Zener to fix the output voltage. For example if the Zener diode is a 12 volt one. The circuit goes 12 volt DC at the output. Diode D1 is just polarity protected.